Although it came in many different forms, I’ve wrestled with anxiety demons for as long as I can remember. 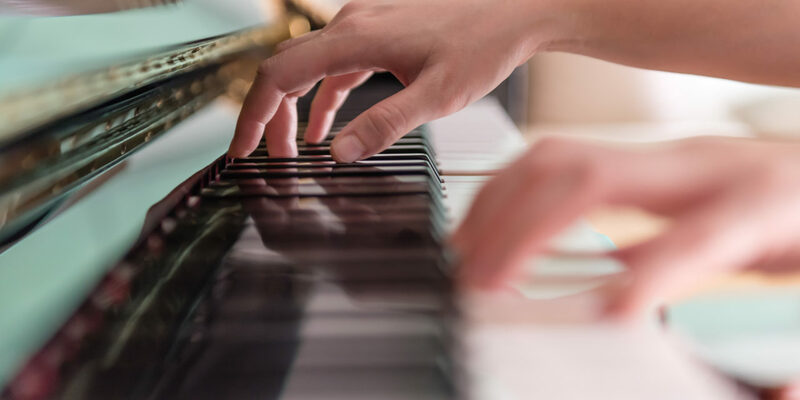 The most enduring of them all, however, was the one that held me in a sweat-inducing vice grip every time I’d try to play piano in front of others. In the solitude of my living room, I was a fairly accomplished keyboardist, playing with feeling, finesse, occasionally even eloquence. But just the addition of a few pairs of unfamiliar eyeballs, and the wheels came off. My focus evaporated, my fingers froze, and the song I crushed 10 minutes before was transformed into note salad. It was painful to play, and l’m pretty sure, to listen to. When I told people about my performance anxiety, most would sing the same refrain—well then just stop playing in front of people. But that’s not as simple as it sounds. Music was a big deal in my family growing up. A very big deal. My father played viola with passion and devotion (and skill) throughout his 90+ years, and two of his last 48 hours were blissfully spent making music with his beloved quartet group. My dad’s older brother, Mark, and sister-in-law, Nancy, were virtuoso professional violinists (he was concert master for the National Gallery Orchestra in Washington, DC, and she was the first woman concert master at the Kennedy Center Opera House Orchestra when it opened in 1976, and eventually became the concert master for the Center’s entire orchestra. No surprise, my father “encouraged” (spelled c-o-m-m-a-n-d-e-d) me to take up an instrument when I was young. For some reason I chose piano, and toiled at the keys for nine years with clenched teeth, practicing 30 minutes a day (not 30:01 minutes). At 17, I finally announced I’d had enough. Finito. Adios. Sayonara. But 15-ish years later, married, with three kids, I sat back down at the small spinet we had back then. I suppose somewhere deep in the recesses of my brain I wanted to experience the joy that my dad and other relatives clearly had when they played. I signed up for lessons, and to my astonishment, found that I was practicing almost daily. Over the 35 years (and three teachers) since, my technique and ability to express myself musically improved dramatically. When I was alone, that is. Nothing I’d learned diminished my distress if I had to perform in front of others. My instructors would inevitably ask me to participate in their semi-annual recitals. Usually I’d pass. Once in a great while, in an attempt to “face my fear,” I’d agree, with deep trepidation. I was almost always the oldest performer. I’d sit stone-faced as six, eight, ten-year olds made their way to the stage, and blithely play “Country Gardens,” “Claire de Lune,” and “Für Elise” to the warm applause of the audience. Then the adolescents took their turn, some of them executing astonishing feats of keyboard acrobatics, while beads of perspiration began erupting on my forehead. Despite all my efforts to enlist Einsteins’s Theory of Relativity to reverse the passage of time, my turn inevitably came. I’d stand gingerly, fighting the vertigo that threatened to take me to the floor. A dozen unsteady steps later had me at the piano. I’d arrange my sheet music with icy hands, take a last frantic breath, and begin…. Psychologists who write about anxiety often offer glib advice about realizing that the thing you’re most afraid of is simply a fantasy in your head. After all, what’s the very worst thing that could happen at a recital? Hmmm. Lemme see. How about having 60 or so strangers watch as my frozen fingers jittered through 12 notes, having to stand up and say, “Sorry. I can’t play today,” and hearing a smattering of perplexed clapping as I tore out the back door. A few months ago, I astonished myself when my piano teacher asked if I’d consider playing in an upcoming recital, and I replied yes. What was I thinking? For starters, I guess I ran the numbers, and realized that at 65, my opportunities for experiencing a joyful moment sharing my music were diminishing rapidly. Maybe it finally hit home that a recital had nothing to do with me, and everything to do channelling the music to the audience. Or possibly I’m just plain fed up with assorted nasty psychological imps and leprechauns diminishing my life. And I’d learned a thing or two about managing my anxiety. I swam 20 laps just before the concert, leaving my body with a lot less fuel to start a wildfire. I consciously began deep breathing while driving to the recital hall, to keep adrenaline from shooting like a geyser into my bloodstream. And finally, I wore a ridiculous screaming pickle charm I’d picked up from a festival somewhere, to remind myself not to take myself too seriously. I won’t pretend I was comfortable when my turn came. I was still ill at ease. But I managed a self-deprecating joke with the audience before I started, and for the first time, I was present in the music as I made my way through my two jazz pieces—I wasn’t trying to race to the finish line so I could get the hell out of Dodge. I actually found myself making deliberate decisions about how I wanted the songs to sound to the audience. And when I was done, they clapped. Enthusiastically. Good job Andy, I wish I could have been there.